Despite the many regions on disc solar flaring activity was low with only a single C1.0 flare peaking at 00:52UT at the North-East limb. 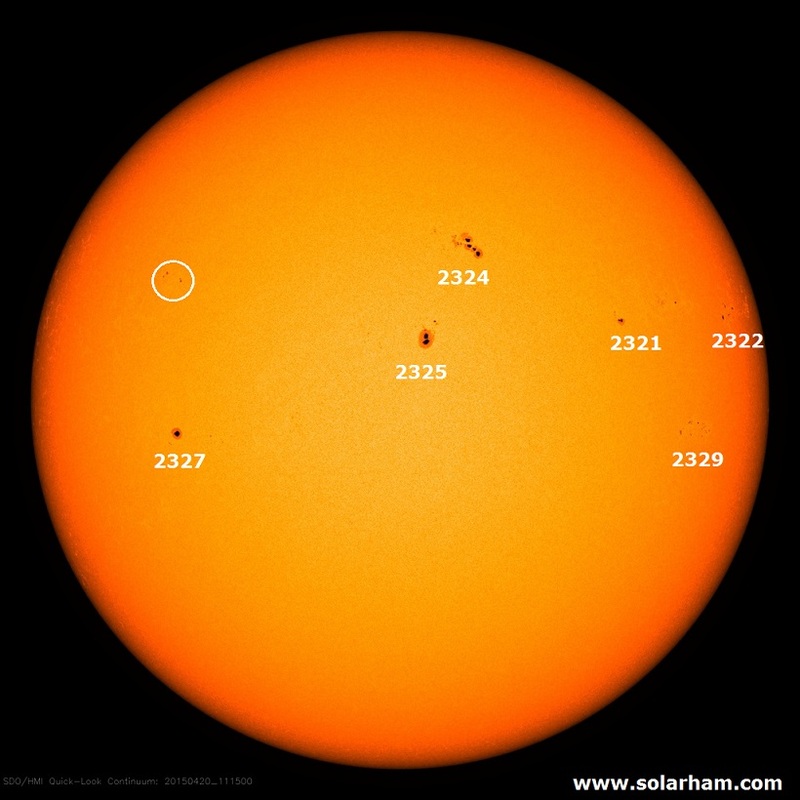 NOAA region 2321 showed some further field diffusion. Some flux emergence was observed in the trailing end of NOAA region 2322. Region 2325 has grown slightly. Region 2329 showed separation of the magnetic footpoints. A new region emerged near N15E38. Other regions were stable or in decay. Flaring at C level is likely over the next days. A (combined) partial halo CME was visible at the West limb of the Sun with an angular width of over 200 degrees and projected speeds as determined by cactus of close to 500 km/s. It concerned a combination of two CME's. The first one is first visible in SoHO/LASCO C2 at 21:12 UT, is directed to the South-West, and is associated with a filament eruption visible in SDO/AIA 304 of the South-West solar limb. The next CME is visible from 21:48 UT onwards slightly more northward on the South-West solar limb. No on-disc signatures could be associated to that event and the second event is therefore likely to be backsided. Based on the location of their origin neither of those CME's is expected to have influence on Earth. Proton levels were at background values. Solar wind speed more or less stabilised around the 400 km/s level. Total magnetic field increased from around 4.5 nT to 7nT before dropping to 4.5 nT again around 9:00 UT. Bz was variable in the +-5nT range. The magnetic field phi angle was stable in the toward sector. Magnetic conditions have been quiet to unsettled (NOAA Kp 1-3 and local K Dourbes 2-3). Nominal solar wind conditions and associated quiet to unsettled geomagnetic conditions are expected in the first 24 although possibly a positive coronal hole high speed stream may increase solar wind conditions later in the day. Afterwards on 22/23 April the arrival of the April 18 CME can be expected leading to active to minor geomagnetic storm conditions.